This Frida Kahlo Skeleton figurine measures 4″ Height, 3.25″ Long and 2.25″ Deep. 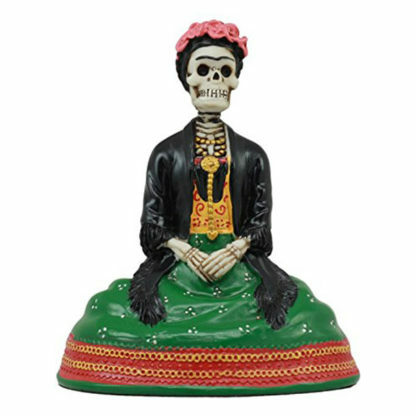 This Frida Kahlo Skeleton figurine is made of designer resin and intricately sculpted with attention to detail. This Frida Kahlo Skeleton figurine is hand painted and finished by our artisans to give it almost real likeness and resemblance. Our Frida Kahlo Skeleton depicts the famous painter sitting with her famous flower crown headband.